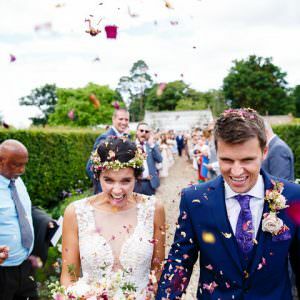 As we reach the midway point of the week, we are here on this rather lovely sunny Wednesday with the most fabulous outdoor summer wedding for you, courtesy of Oxi Photography. 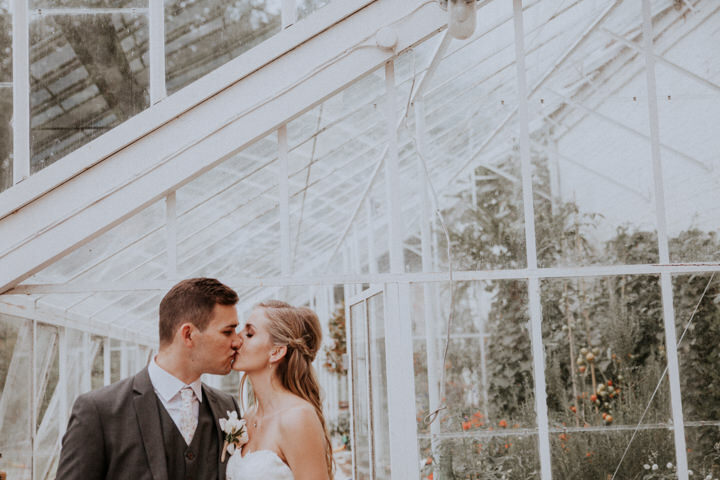 Lauren and Brett chose the secret walled garden as it gave them the freedom to have the wedding they wanted, which was a laid back, DIY, handmade day. 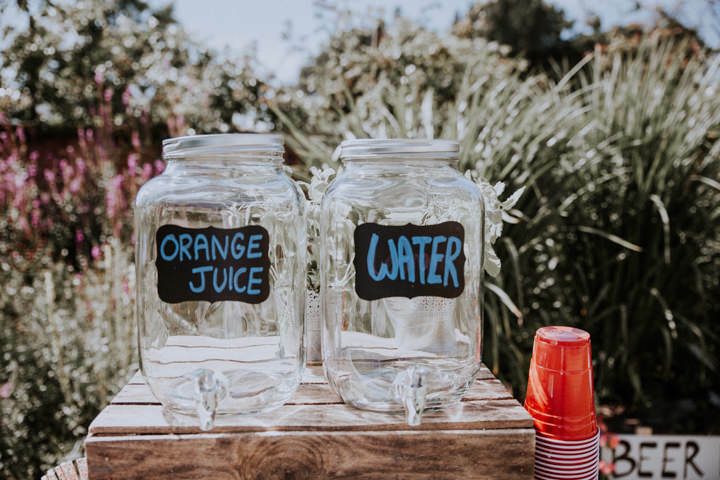 As they were buying a house the same year as getting married, they wanted to keep as many of the costs down as possible. They did this by asking as many friends and family for help as possible. 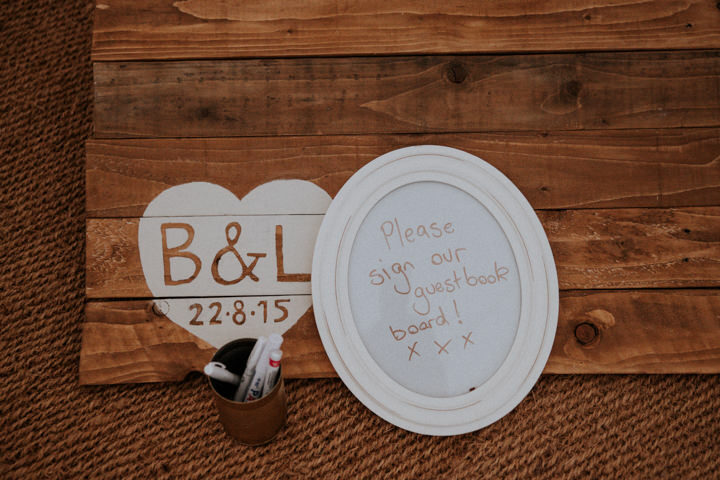 The results are this super cute, handmade heaven of a wedding. 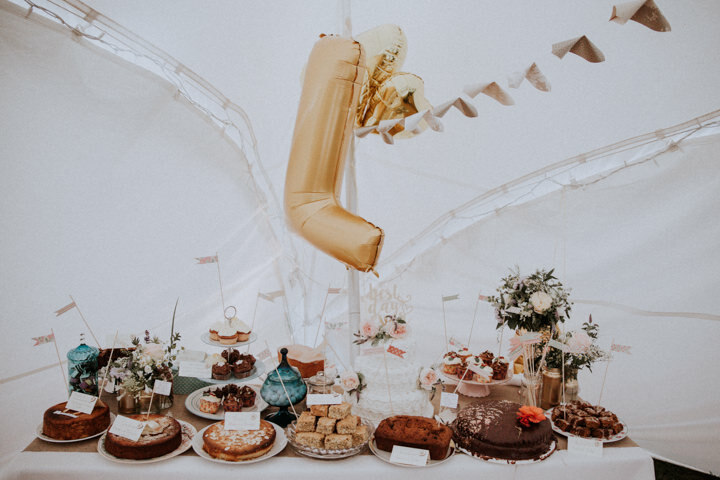 My personal favs are the full to bursting cake table, the signage and the beautiful blooms. 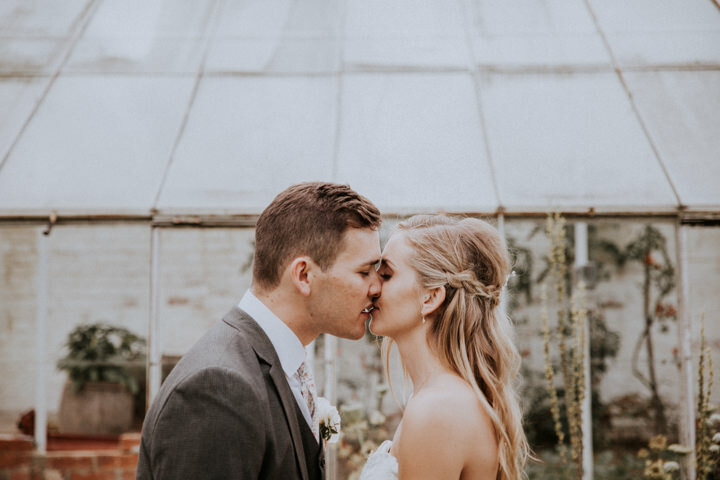 Our wedding day was absolutely everything we wanted and more. It was heartfelt, personal, and full of fun, love and laughter. And full of cake, lots and lots of cake. We met when we were 16 at sixth form, and have now been to together for nearly 13 years. We are now expecting our first baby in May 2017! Brett and I travelled to New Zealand and tried to see as much of the north island as we could, but we also had our hearts set on Whale watching, so squeezed in a flying visit to Kaikoura on the south island. When we arrived we saw a sign outside the visitor’s centre saying it was going to be a really clear night and they were offering star gazing tours – Brett said we should skip the tour and just head to the beach at dusk to view them on our own. 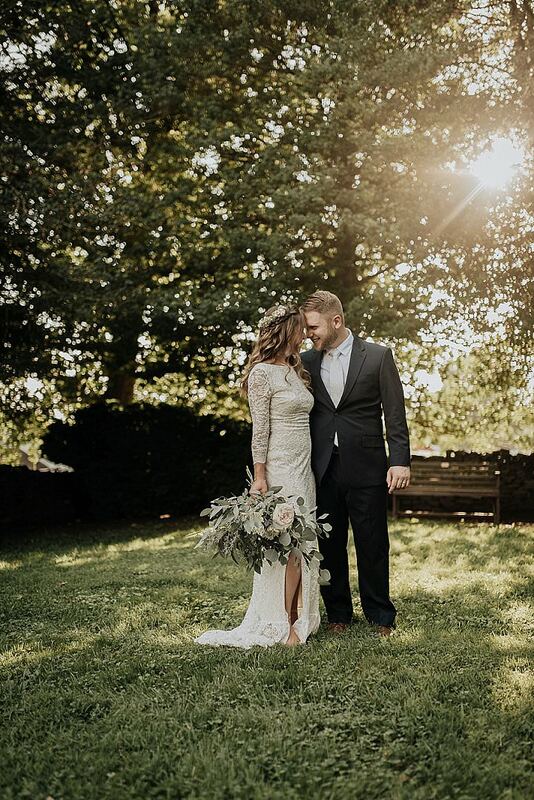 It was under this incredible, crystal clear view of the Milky Way, with the mountains behind us and the sound of the sea crashing on the pebbles, that Brett popped the question with his hands clasped to his grandmother’s stunning gold, teardrop opal ring. Needless to say it was a very emotional and romantic moment – absolutely unforgettable. 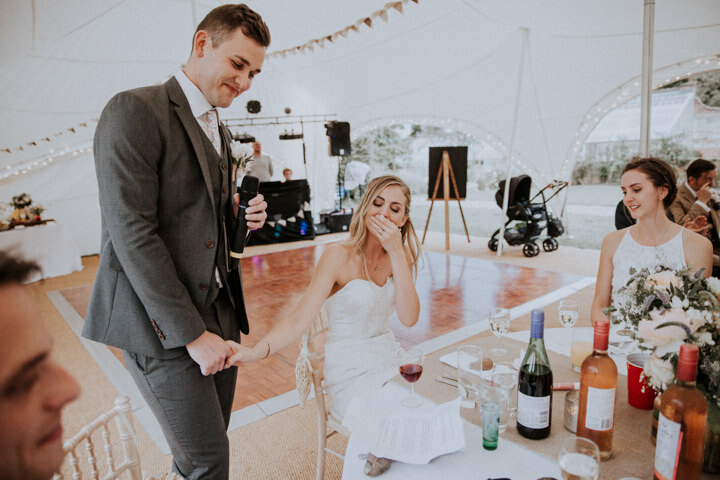 We decided we were going to buy a house in the same year as the wedding, so our budget was very, very tightly managed to ensure we didn’t touch our deposit. 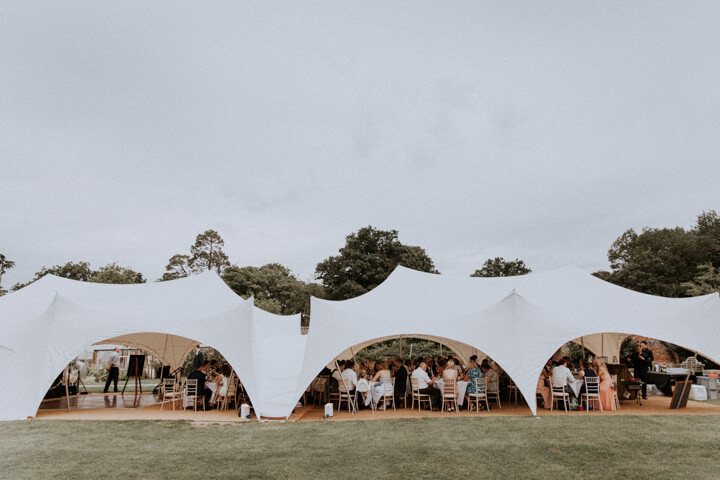 Our priorities were photographer, marquee and catering, as we wanted our guests to be comfortable, fed and happy, and for everything to be captured beautifully in our photographs. 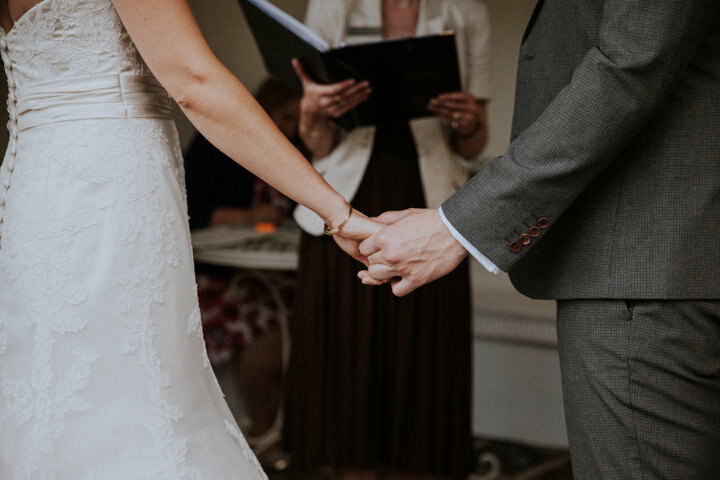 Anyone can take a picture, but it’s amazing how many bad wedding photographers are out there so it is 100% worth researching and being willing to pay a bit more for someone who has true talent. The best advice we were given was to ask for help from friends and family; mum made the garlands, dad made the signs, bridesmaids and groomsmen were incredibly helpful with finding their own outfits and making / serving the reception drinks, and all the bakers we know were roped in to bring a sweet treat for the dessert table. We also saved a lot of money by sourcing the table decorations and garden games from charity shops / ebay or were borrowed from friends. We bought wine and soft drinks in bulk months beforehand, and we made our own save the dates and wedding invites. 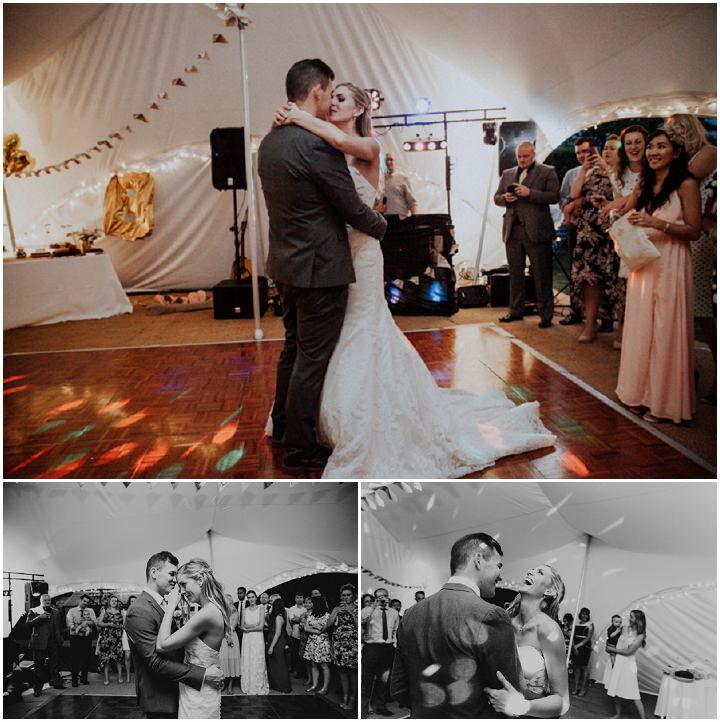 One incredible strike of luck was that our wonderful marquee provider Alex was incredibly hands-on and so helpful on the day, and he also put us in touch with Jim who was not only a great DJ, but played the guitar, so he doubled as ceremony musician and evening entertainer! We absolutely fell in love with Oxana’s very unique combination of reportage & artistic style of photography. 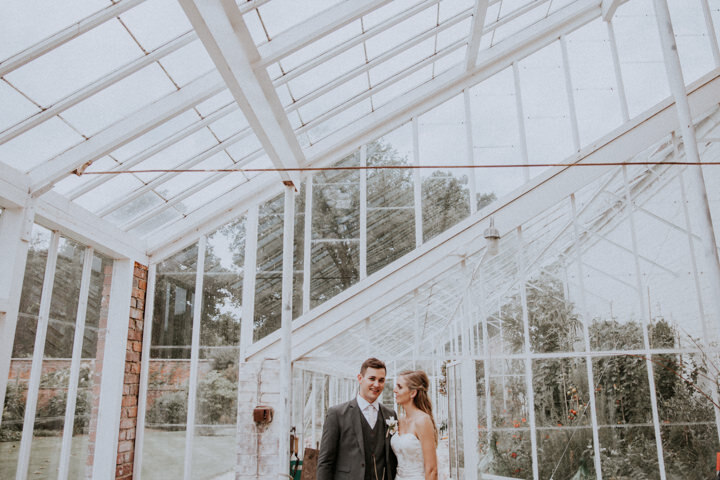 Brett was very apprehensive as he is not keen on being photographed, so I ensured we met Oxana first by having an engagement shoot which helped to put him at ease, and also gave us a taster of Oxana’s wonderful style. 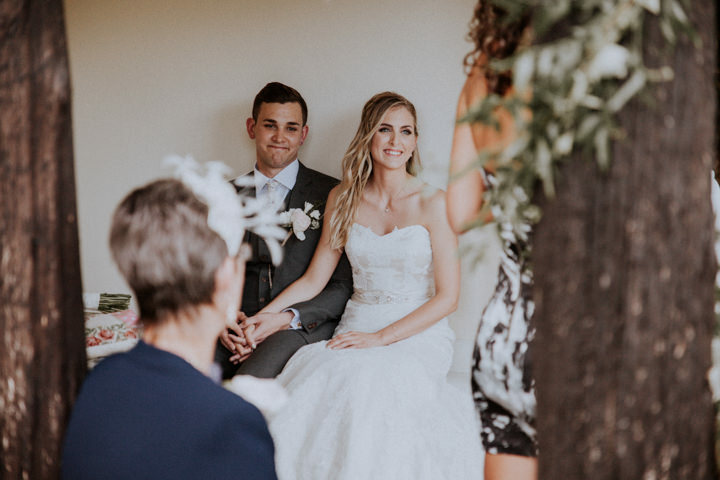 She shoots life as it is, truthfully and beautifully, and has captured some wonderful shots of the wedding day that we will treasure forever. We’ve even asked her to come and photograph our new baby once she’s here! 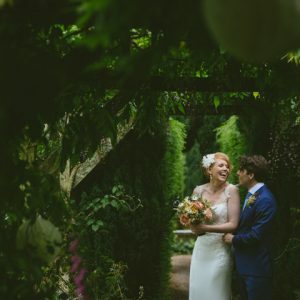 I bought a sleeveless ivory dress with lace overlay I found in the sale in a local wedding dress shop – I fell in love with the how it fitted and the length of the train and I realised I could personalise it by asking a seamstress to take it in a bit more at the waist and to add buttons all the way up the back. My shoes were gold and sparkly mid-heels from Kurt Geiger, and I glued the silver sixpence that my grandma gave me on the sole. 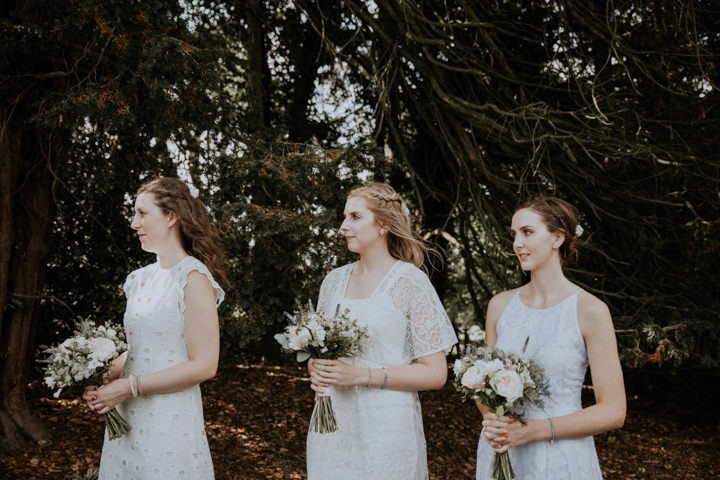 My other accessories were simple; a trio of gold & pearl hair adornments from etsy, a gold and opal necklace my mum gave to me, a gold bracelet as my something borrowed from mum, some teardrop sparkly earrings from Accessorize, and lace and blue garter from my bridesmaids. My hair and makeup was brilliant. I had the worst night’s sleep the night before and Frankie not only hid my eye bags, but used makeup that stayed put all day through the heat and tears. She did a great job of making me feel pretty but keeping the look natural. My hair also seemed to double in thickness and stayed put all day! 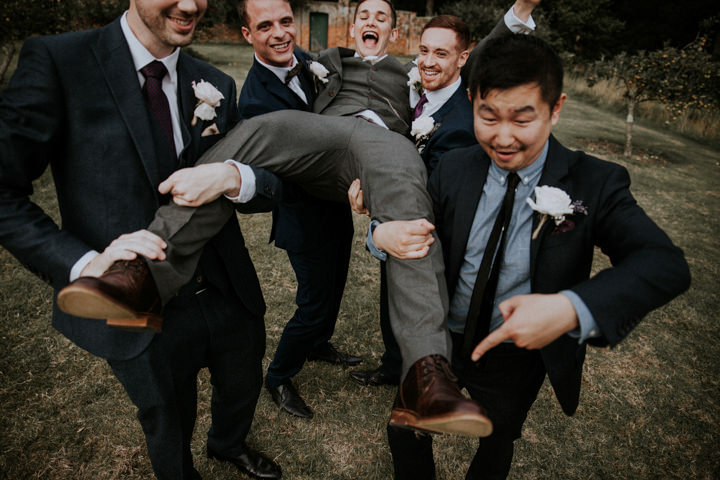 Brett tried on many suits, and in the end decided to buy something he could wear again. 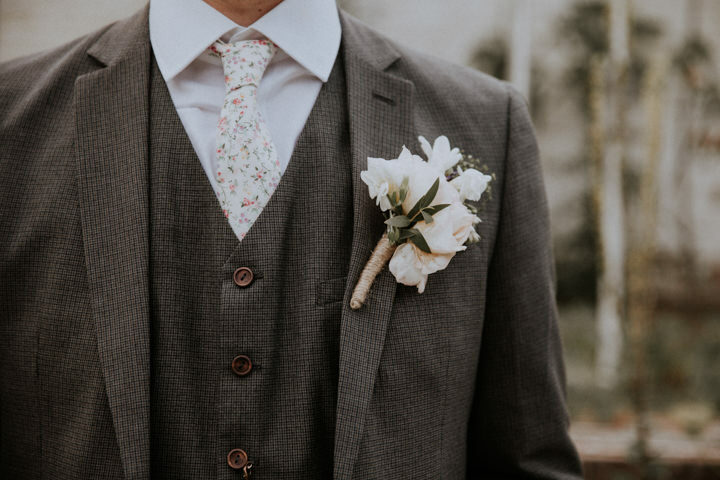 He absolutely loved a grey three-piece suit he found on ASOS, got a beautiful hand-made floral tie from etsy, some very cool brown brogues, and he also borrowed a beautiful vintage pocket watch from a friend. 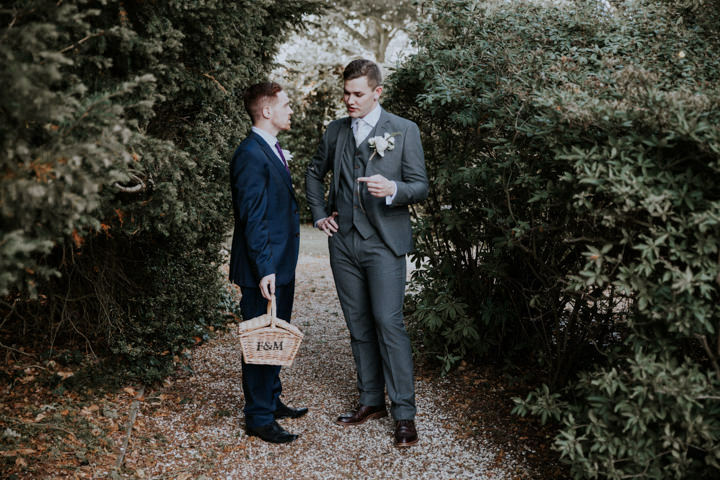 The groomsmen were given the very loose instructions to wear something they already owned or wanted to wear that was coordinated with each other, but not matching… which in hindsight was quite a difficult brief! 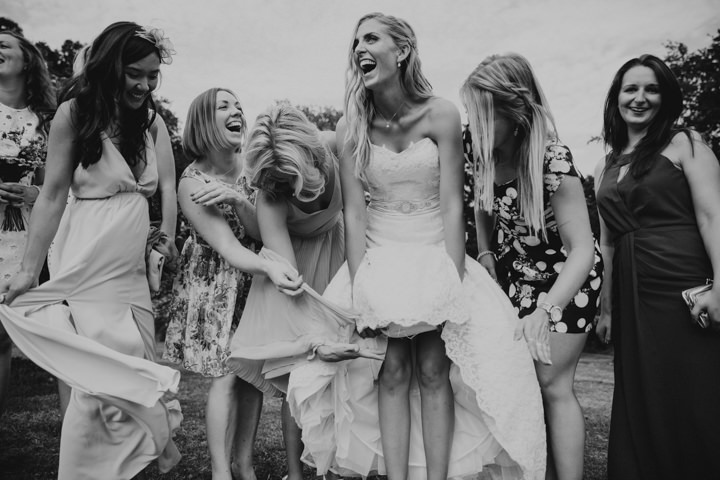 The bridemaids were also instructed to wear a dress they wanted as long as it was white! 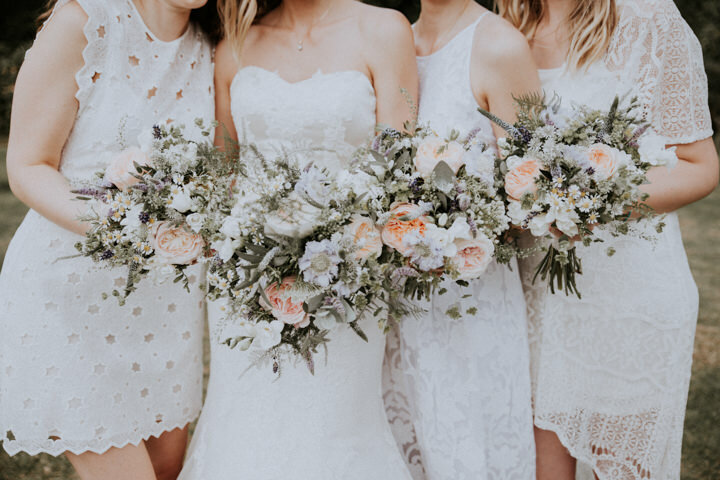 The dresses suited their individual styles perfectly! 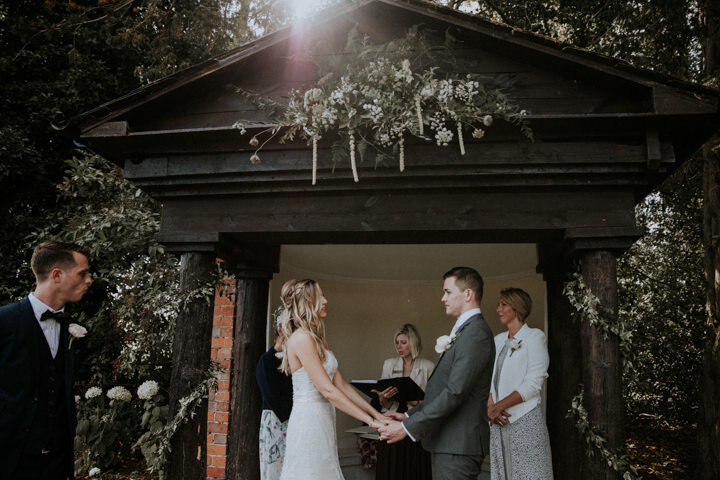 We didn’t have a particular colour scheme, but there were influences from the engagement ring with gold accents throughout; I bought some wallpaper I found in a Next outlet store in golds and creams which my mum skilfully turned into some garlands. We also collected glass jars for months which we sprayed in a variety of golds and bronzes for the tables. 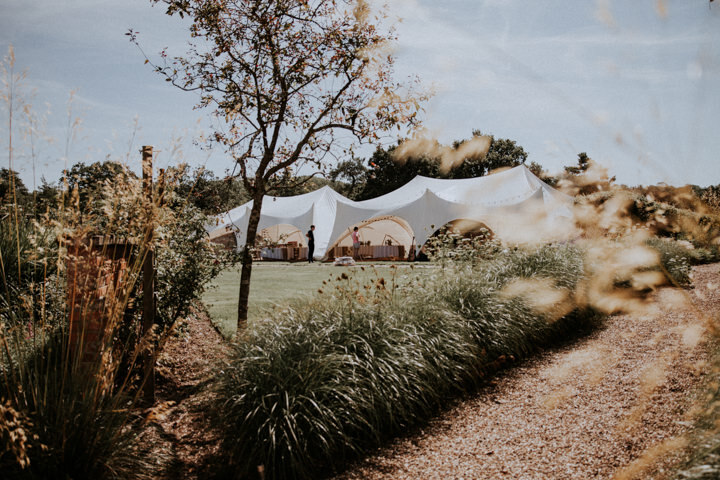 Other than that we just tried to accentuate the natural beauty of the garden by removing the panels of the marquee so we could see the flowerbeds and greenhouse, and by having lots of natural and wild flowers everywhere. As neither of us know anything about flowers it was really hard to know what type of florist to go with, and what to ask for. We met Jennifer of Yours Truly Flowers at a local wedding fair. 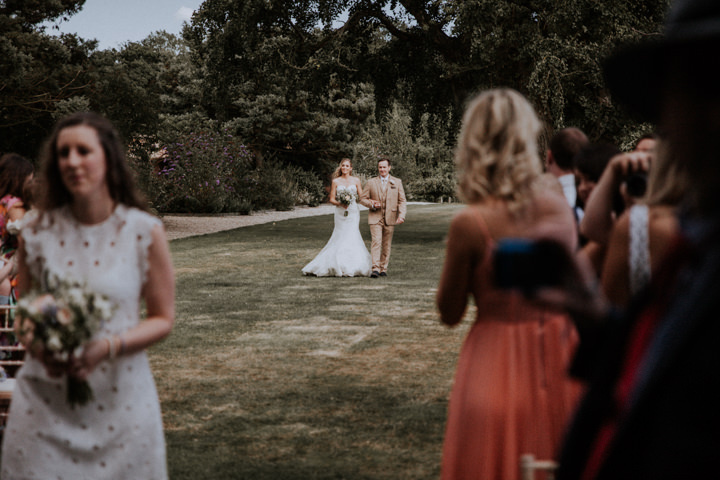 What was brilliant is that she took the time to go and visit the venue and understand what it all looked like and how it would all go together. 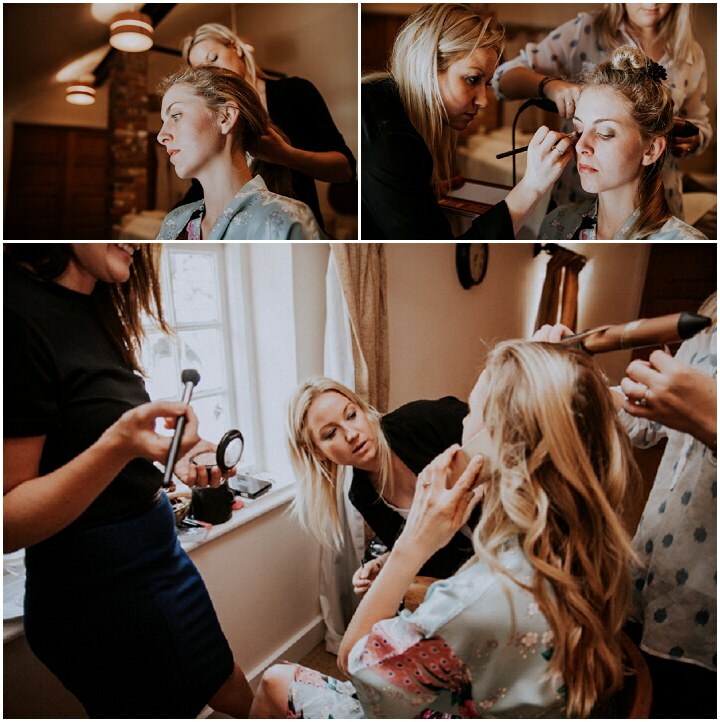 This attention to detail really put us at ease, as we knew Jennifer would make sure everything looked perfect on the day. 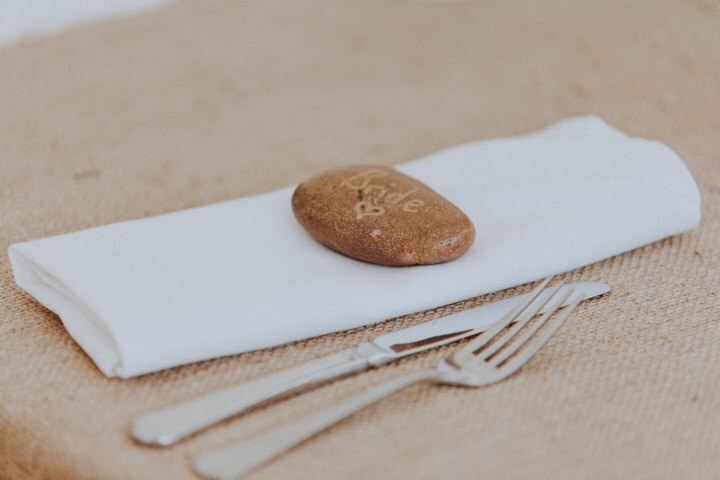 In addition to the glass jars of flowers on the tables, we also hand-wrote our guest’s names on large flat stones for the place settings and doubled as a favour for our guests. We named our tables after the locations we visited in New Zealand. 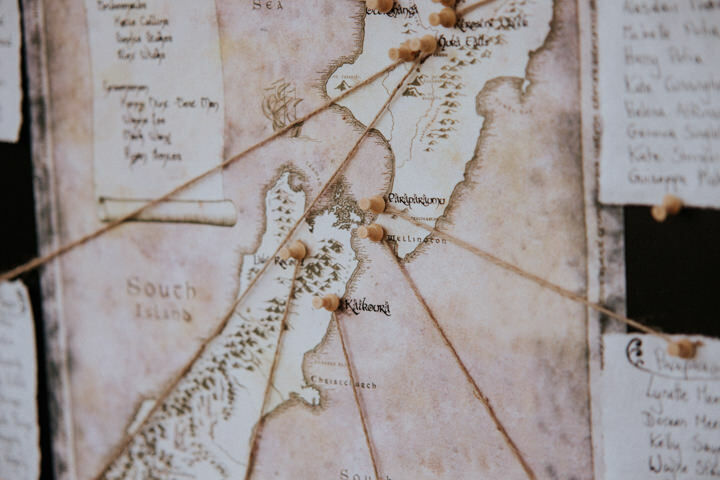 We used a lord of the rings inspired map of New Zealand for the seating plan – with the title “the fellowship of the engagement ring”. 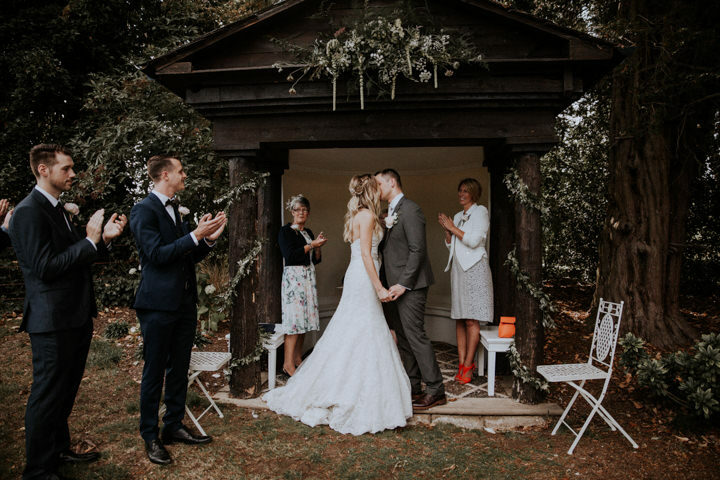 The wedding ceremony itself was at the bottom of the garden in the bothy, and Jennifer made a stunning greenery arrangement that adorned the top of the structure, and wrapped the pillars in ivy – perfectly framing where Brett and I stood. 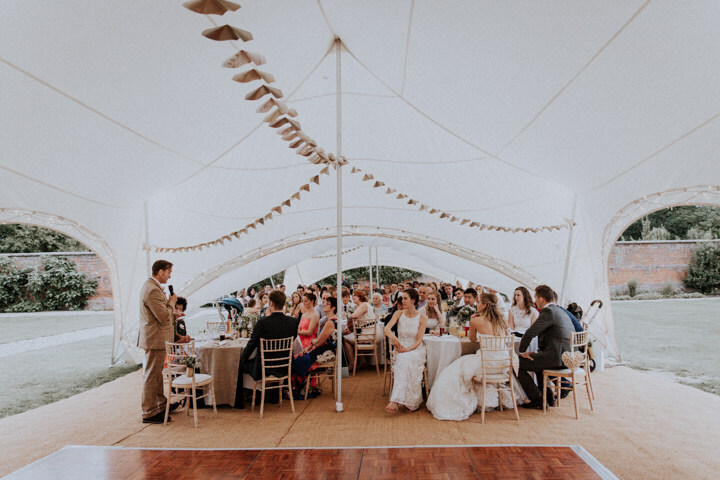 She also hung sprayed-gold tins with little flower posies off the chairs that lined the grass aisle. 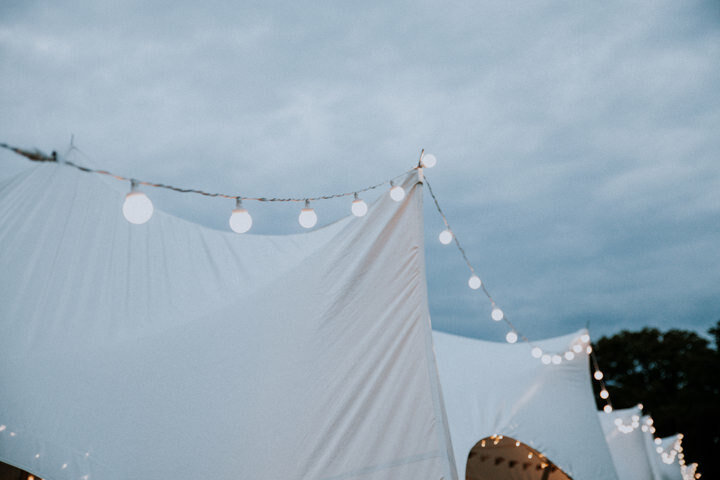 We used large gold balloons with our initials behind the cake table, strung the handmade garlands all around the marquee, and Alex did an incredible job of illuminating the marquee with fairy lights. 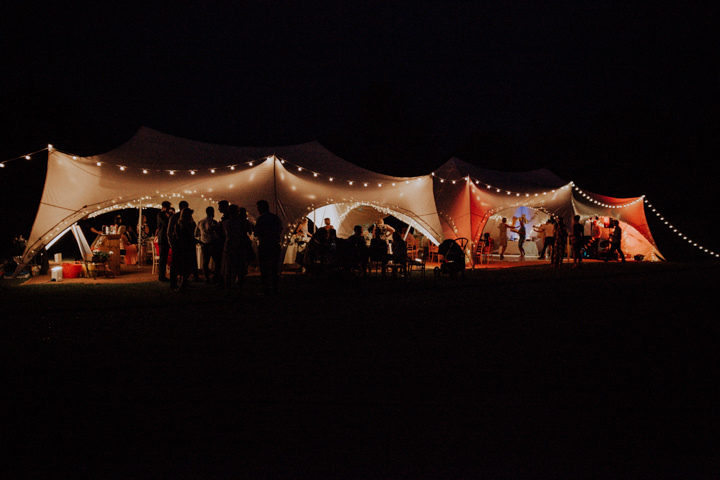 We also supplemented the lighting with decorative paper bags containing battery powered LED candlelights around the garden so our guests could find their way after dark. 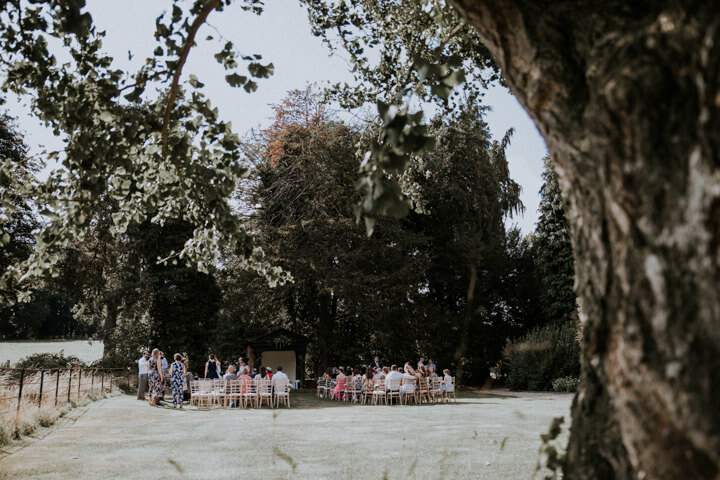 We filled tonnes of brown paper bags with sweet popcorn for a snack with the reception drinks, and then we had a delicious Hog Roast with all the trimmings. And of course dessert was an assortment of amazing cakes and biscuits from the guests themselves. We were eating cake for days afterwards! 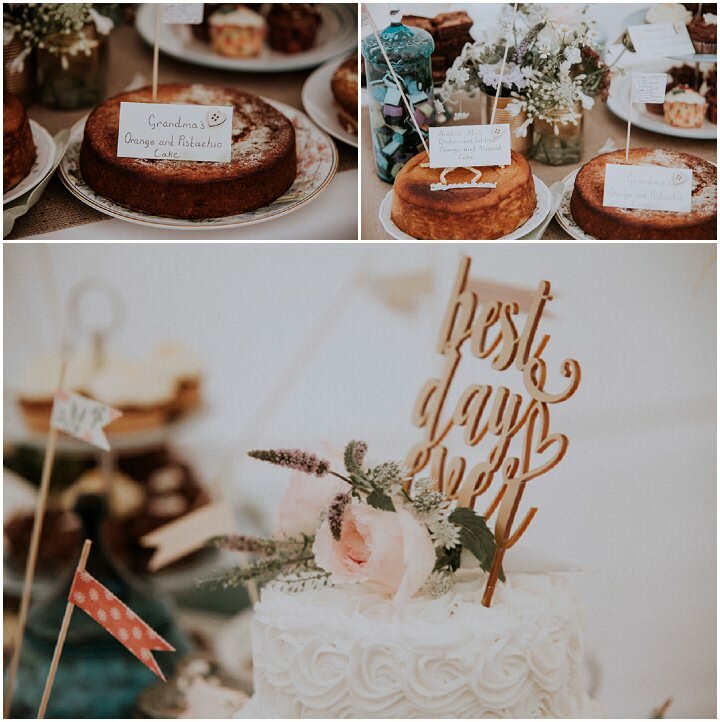 The wedding cake was a delicious iced, three-tiered chocolate, vanilla sponge and fruit cake from M&S which Jennifer helped to decorate with fresh flowers, and we popped a “best day ever” gold sign on the top which we bought from Etsy. I am lucky to have a very talented sister who sang during the signing of the register whilst Jim played the guitar. During the reception drinks we had our favourite music on a spotify playlist over the sound system, and then in the evening we had a combination of karaoke and DJ. 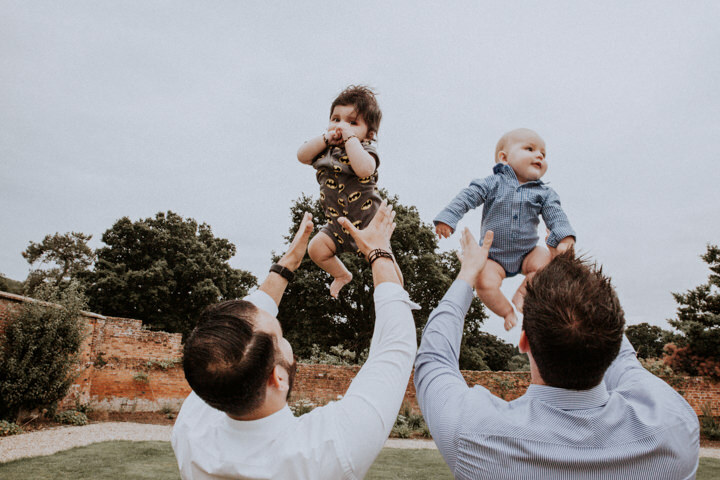 We sent out save the dates which were simply a small piece of brown card with “we’re getting married… you’re getting a balloon” and a gold balloon which revealed the date and location once inflated – both ordered online from a printing site on ebay. The invitations were a template from minted.com, to which we then attached a little bronze key and luggage tag with the invitee names and the wedding website address in keeping with the “secret walled garden” idea. 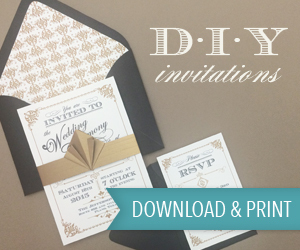 It saved a lot of money to keep the invites minimal and to have all the details online. It also meant RSVPs were easy to keep track of as it was optimised for use on smart devices. Pretty much everything! Like most brides, I got inspiration from Pinterest, but I also got inspiration from Etsy. I’d always consider if I could make it myself or find a cheaper way of achieving the same effect before purchasing. Seeing each other for the first time at the ceremony was of course the most surreal and amazing moment. Then afterwards to let go all of the stresses and worries we’d had leading up to the day was amazing. We were with everyone we love, we were having lots of fun, eating great food, drinking lots of lovely drinks, and we were the ones who had brought the vision to life. We were very proud of ourselves, and so grateful to all who had supported us in getting to that moment. It was a spectacular day. 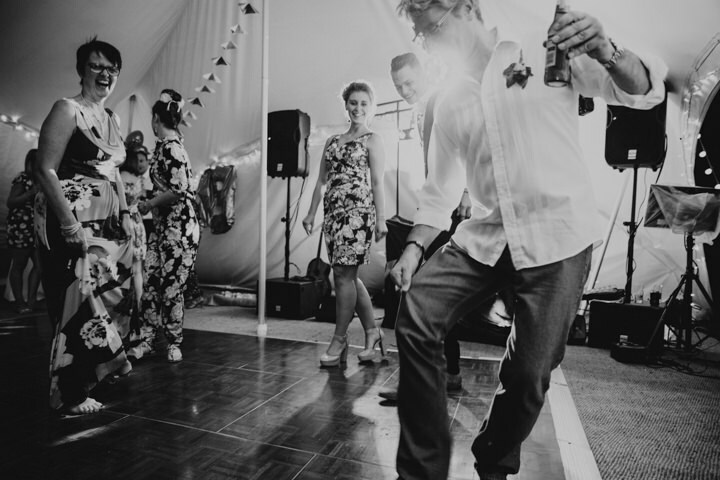 Consider your venue very carefully and don’t feel pressured into spending a lot of money. 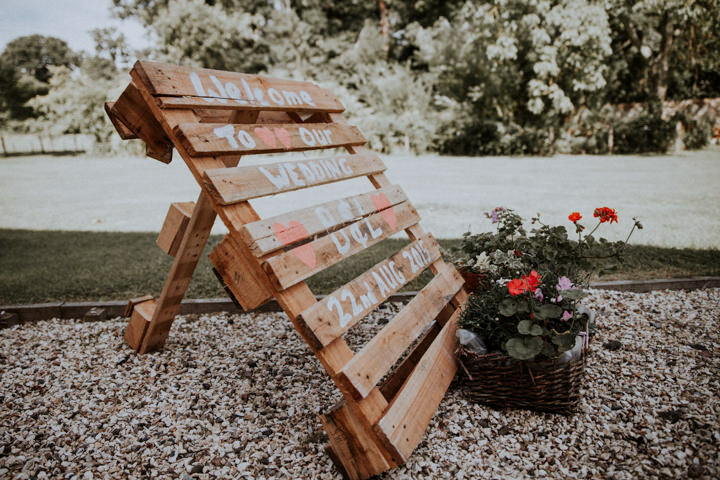 Don’t feel as though something needs to be done because “that’s how it is at weddings” – it’s your day, you should be able to customise it however you want! Remember that the only opinion that matters is your own, and you are both a team, so share the responsibility for making decisions and getting things done. 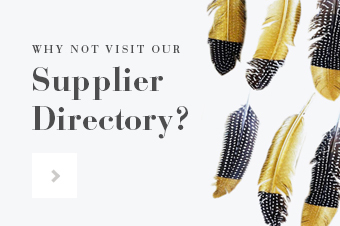 We had a spread sheet to manage all of our spending and to keep track of suppliers invoice dates and deposits which we could not have managed without. 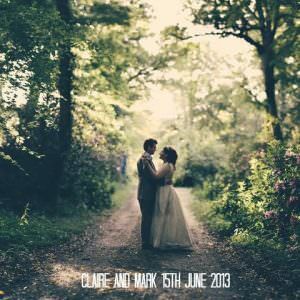 One other great tip we were given before our big day was to sign up to the app Wedpics – this allowed us and our guests to take and share each other’s photos on the day itself, and the days leading up to the wedding. 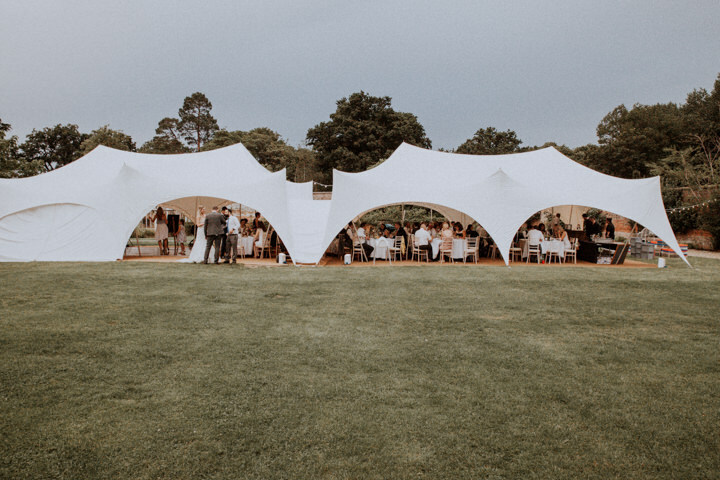 That even with meticulous planning, there will always be something that doesn’t go to plan…. 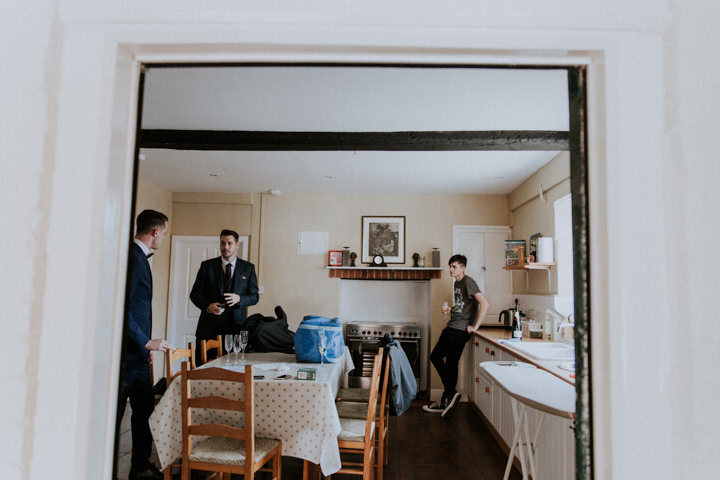 The biggest surprise was finding out our caterer had failed to read our “supplier information sheet” that had been sent to them a week before, and ended up arriving at our tiny one bedroom house rather than the wedding venue which was nearly an hour away. The food was delayed, but thankfully the hog roast cooked quickly and the taste was not affected. 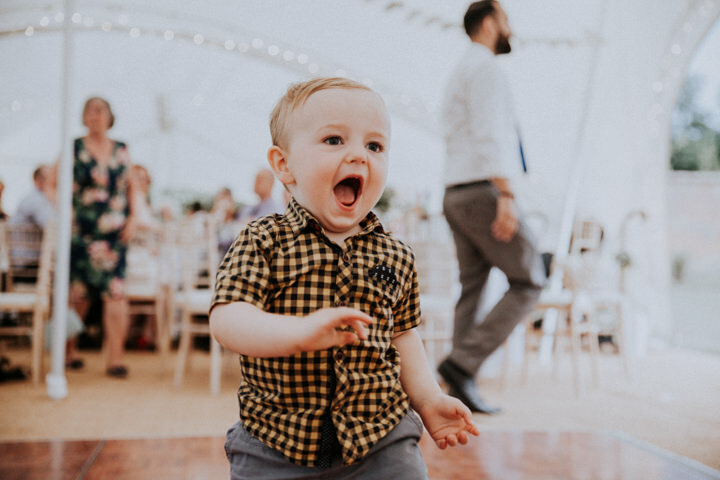 Its for this reason I am very grateful we bought wedding insurance that would have covered us for any emergency expenditures! Kelly – Omg those shots are beautiful – Such gorgeous photographs. Just love these.